SKANEATELES, NY (April 12, 2019) – Cross-curricular opportunities are a fantastic avenue for students to work with other students, and in this case learn about courses that could be in their future. 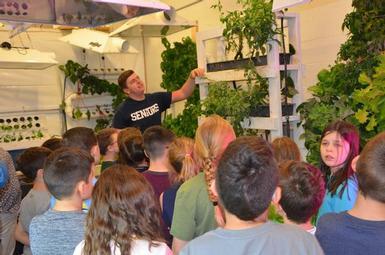 Earlier this week, third grade students from State Street Intermediate School visited Scott Stagnitta’s high school hydroponics class, where they received a personal lesson from high school students on hydroponics. Hydroponics, a form of hydroculture, is the method of growing plants without soil, using mineral nutrient solutions in a water solvent. Each year the students in Stagnitta’s hydroponics class design and create their own hydroponic systems and then put them to use growing basil, lettuce, tomatoes and more, which are used in the Skaneateles High School cafeteria. Visiting third grade students were intrigued to learn about growing plants without soil, as they begin the process of growing their own Teaching Garden at State Street. Currently, third grade students are starting seeds in their indoor greenhouse as they start the process of growing tomatoes, peppers, brussels sprouts, marigolds and nasturtium seeds. Keep in touch with events and happenings in relation to the Skaneateles Central School District by visiting online at www.skanschools.org or following the district’s Facebook page at www.facebook.com/Skaneateles.Schools/. As part of their planning for the outdoor State Street Teaching Garden, third graders have started seeds in their indoor greenhouse. This year, they are growing tomatoes, peppers, Brussels sprouts, marigolds and nasturtium seeds.